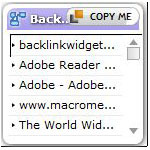 In Links.Display of widgets in order of popularity. This may not have value to you if you do not read Japanese, but this widget does introduce us to the various Japanese bookmarking sites. Each icon is a link to another social bookmarking site. If you have an account, you just log in and can directly post a link to your website. The code is easy to spot on the webpage. Another social bookmarking widget that allows you to post a link directly to several Japanese social bookmarking sites and RSS readers. However, Japanese reading skills and accounts in these services required. Code is on widget webpage. The Google RSS Reader widget is customizeable and easy to set up and install. Only drawback: can only display one site's feed at a time. Simply enter the URL you want to compress, click the button on the bottom (変換する）and the next page will provide you with the compressed, shortened version. Use it as you like. 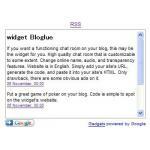 The code for the widget is easy to find on the widget's webpage. This is one of my favorite Twitter badges, and really simple to create. 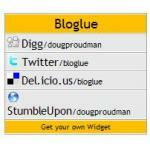 Just enter your Twitter username on the widget's website (Widgetbox) and then click the button to get code. Great Twitter-like style. This one is showing Bloglue's Twits. 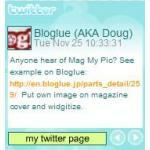 Create your own widget for your blog or web site and spread it over other social platform. 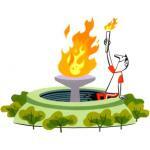 Want to support efforts to bring the Olympics to Tokyo in 2016? Put this widget or one of the others offered on the widget's web page. By clicking on the blue tab a vote in favor will be cast. See the number of votes. There is a lso a countdown on the bottom to the date that the host city is decided, next year on October 3rd. Codes are easy to spot on web page.